Review: Captain Beyond ‘Live in Texas October 6, 1973’ – Cleopatra Records, Inc. The latest CD to be reviewed, was by another of those unknown artists, well, certainly unknown to me. 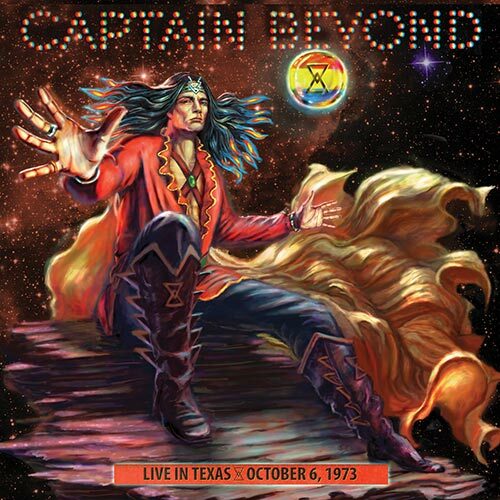 The album is Frozen Over Texas (Live 73) by Captain Beyond. First port of call was an internet search to find out a bit about Captain Beyond, and I was surprised at the information I found. Captain Beyond are described as one of the more overlooked �supergroups� of the time. The composition of the band was very impressive, Rod Evans (lead vocals and ex Deep Purple), Bobby Caldwell (drums and ex Johnny Winter Group), Larry �Rhino� Reinhardt (Guitar and ex Iron Butterfly) and Lee Dorman (bass and ex Iron Butterfly). The band released 3 studio albums, Captain Beyond (1972), Sufficiently Breathless (1973) and Dawn Explosion (1977), but it was the debut album that gained the highest plaudits. The album being reviewed, Frozen Over Texas (Live 73) was recorded prior to the second album being recorded and is the only live material from the band to survive. I also have managed to glean that the Frozen Over Texas album is in fact a cleaned up (sound-wise) bootleg version of the Far Beyond A Distant Sun-Live In Arlington Texas which apparently had better sound to start with. My main gripe, and I�ll mention it at the start, is that I do wonder what the sound quality will be like. Frozen Over Texas is a 14 track album with a total running time of around 68 minutes and has 3 tracks lasting under the 2 minute mark, with track 8, �Thousands Of Yesterdays,� the shortest at 1:33 minutes. The longest track on the album is track 12, �Drum Solo� clocking in at just under 13 minutes (12.52). This is certainly an interesting release, and bearing in mind that it does appear to be the only live recording that exists, it is also a historical statement. Having listened to the album many times, I must admit to finding it an amazing piece of work. Remember that this is a reviewer that isn�t totally convinced of the merits of live albums in general and is very critical of poor quality sound. Once I had accepted the sound limitations, then the music did indeed, win me over. My favorite tracks, at the moment are track 2, �Distant Sun,� track 3, �Dancing Madly Backwards� and track 4, �Armworth,� which are all early tracks after which the band moves into a more �spacey� feel to some of the tracks. �Distant Sun� (5:51) is from the second studio album and has an amazingly powerful driving bass/drums start before the keyboards appear. The vocals while not the most powerful, are adequate and do manage to remain in key, most of the time. The track continues with the keyboards and guitar adding a layer of sound above the rhythm engine. There is some superb lead guitar work which powers the track along. �Dancing Madly Backwards� (4:42) has another intro that is heavy with drum and bass power and more of that majestic lead guitar riffing. There are nice tempo changes, and the band drives the track along before a blistering guitar solo fires up around the 2:05 minute mark. I assume at this point, Rod is desperately banging away on his tambourine awaiting his return to vocal proceedings around the 3:05 minute mark and takes the track out. The short fourth track, �Armworth� (1:40), is a little shiny nugget and cuts a perfect heavy rock feel. This track may be short but certainly big in the impression it leaves. Despite Frozen Over Texas being a live and not perfectly recorded bootleg, it is, by virtue of it being the only live material from Captain Beyond, a collector�s item. The album is certainly worth a few listens and while falling short of a special �One To Buy� sticker, it certainly comes with a big �Highly Recommended� tick on the cover.